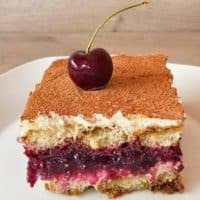 This Super delicious and decadent Cherry Tiramisu is a cross between Black Forest Cake and Tiramisu! And is super simple to make, I kid you not! 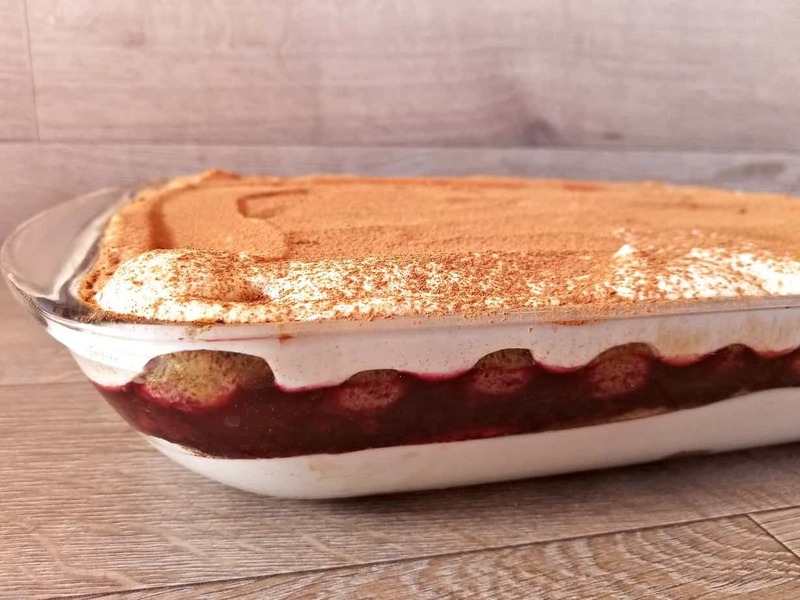 It is said the origin of tiramisu goes back to the 1960s in the region of Veneto, Italy. 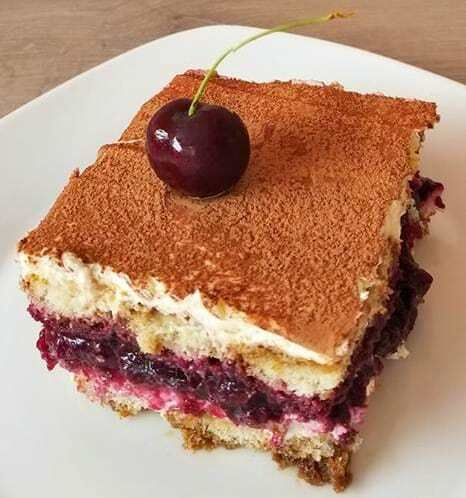 Tiramisu has several meanings such as “pick me up”, “cheer me up” or “lift me up”. And is coffee-flavoured Italian dessert. That is made with espresso or strong roast coffee and mascarpone cheese, and cocoa among a few other key ingredients. Just be sure to follow the directions I have listed below and you will be on your way to Tiramisu heaven! 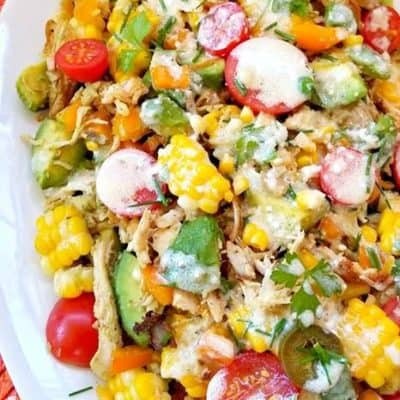 You may be thinking, can it really be made without the eggs? Doesn’t traditional Tiramisu have raw eggs in it? And my answer to that is “Yes” and “No”. 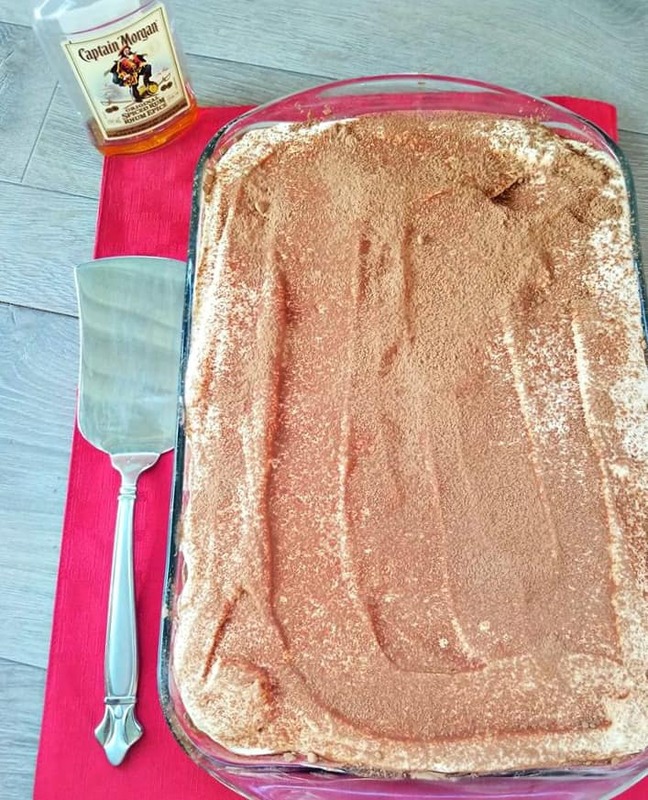 Some traditional Tiramisu recipes that hail from Italy will ask you to put raw egg whites in the Tiramisu. However not all Italians do that, just look at Laura Vitale recipe which this recipe was inspired by. She is Italian and does not agree with putting raw eggs in her recipe either. The reason some do that is one because it’s tradition and two it also creates a light and fluffiness to the cake. However with mine, we are substituting those raw eggs for fresh whipped cream which helps to maintain that light fluffy texture. And is much better if you ask me! See this whole sheet cake above? Between me Jason and my girlfriend had it polished off in two days. It is that good guys!! The whole darn thing was gone in less than 48 hours 🙁 and I was so sad. Also if you have kids in the house or don’t drink alcohol you can omit the rum. 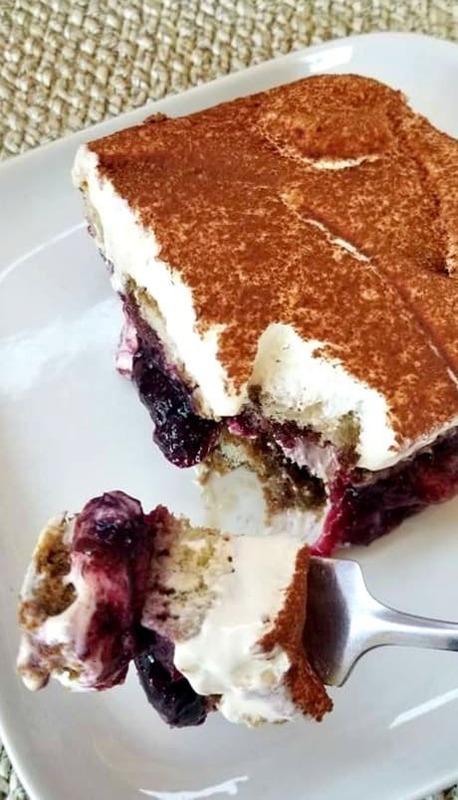 You can make the Tiramisu more on the sweet side like most cakes or follow the traditional Tiramisu style that has more of a liquor espresso taste, which I must prefer. Plus the cherries have enough sugar in them already so adding heapings of extra sugar is not necessary. 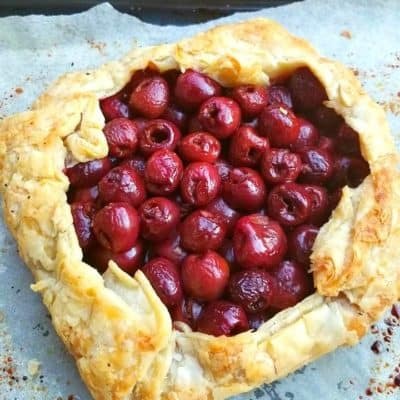 I used fresh sweet cherries for this filling and cooked them down with a little cornstarch and water. 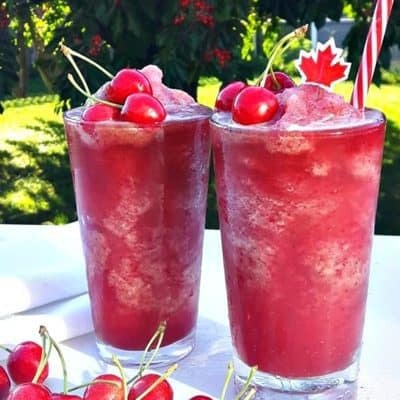 You can use fresh or frozen cherries just make sure there the sweet ones otherwise you will want to add some sugar as well. 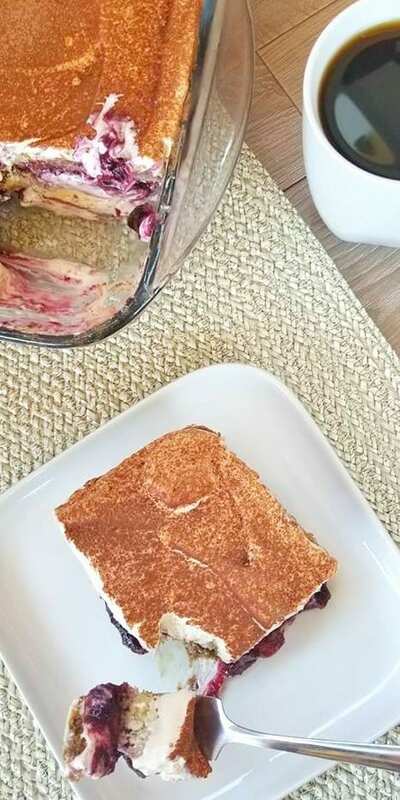 And if you want to skip the stovetop cooking method, by using a cherry pie filling instead. Just keep in mind most of those are filled with sugar so your Tiramisu will be allot sweeter than mine. 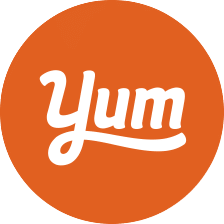 If prepare it from scratch it tastes much better if you ask em. Tiramisu has always tasted best the next day, so if you cannot wait the 24 hours. Allow it to sit in the fridge for at least 6 prior to serving. 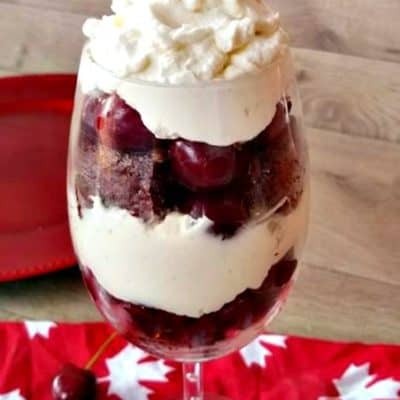 Also feel free to replace the cherries with raspberries if you’d like, they go really well with the Tiramisu flavors as well. 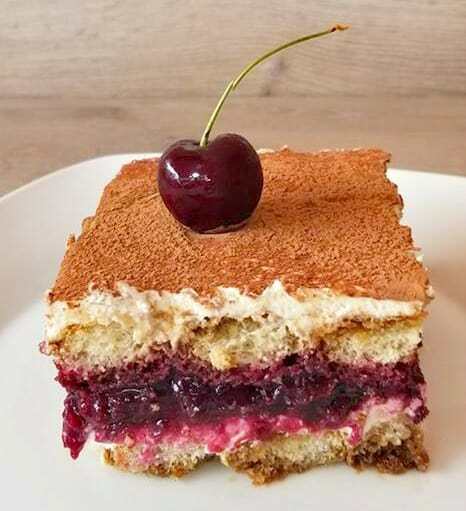 This Super delicious and decadent Cherry Tiramisu is a cross between Black Forest Cake and Tiramisu! In a medium saucepan add 4 cups of pitted cherries, lemon juice, water and cornstarch. Whisk over medium heat for 5 minutes until the cherries start to turn a bright pink. 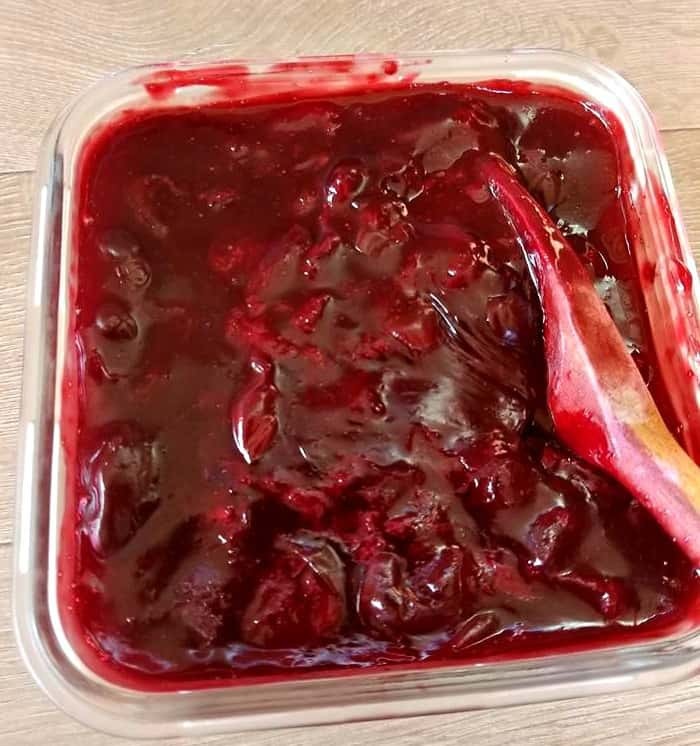 Make sure there is no lumps from the cornstarch, turn the heat down to low and allow the cherries to simmer for another 5 minutes. Remove from the heat, place into a cold bowl in the fridge and allow the cherries to cool completely. You will want two separate bowls "ideally metal mixing bowls" in one bowl add the mascarpone cheese, vanilla extract, lemon and sugar. In the other bowl add the whipped cream. 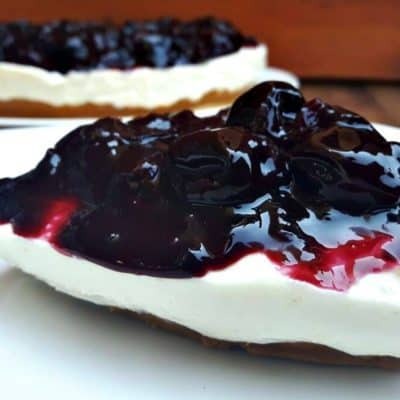 Start by whipping the mascarpone cheese bowl till blended then remove the filling from the whisks and whisk the whipped cream till light and fluffy. Then fold in the whip cream into the mascarpone cheese. Without wasting any time. In a medium size bowl add the brewed espresso and rum liquor of your liking together in a bowl and whisk to combine. Them open your dry lady fingers and dip them in the expresso. Do not leave the ladyfingers in the expresso too long otherwise they will fall apart. Place each soaked Lady Finger into the bottom of a 9 x 9 baking dish and repeat until the bottom of the dish is covered. 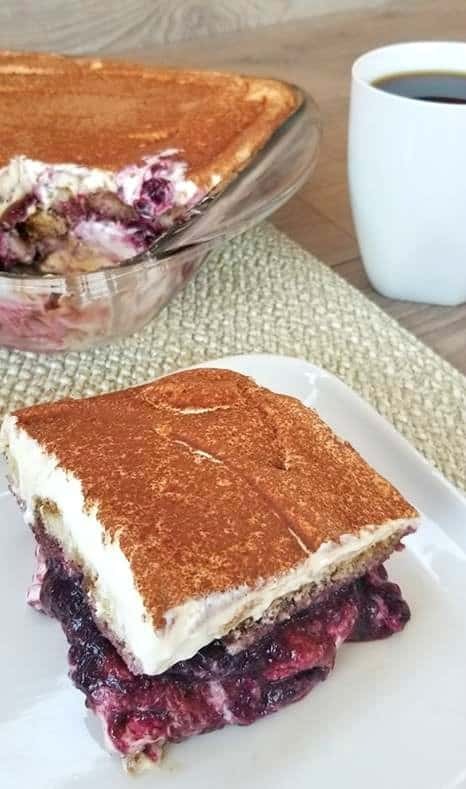 Now comes the fun part, with a spatula start to pour half of the mascarpone and whipping cream mixture overtop the first layer of ladyfingers. And spread evenly over top of them with a spatula, then using a sieve dust 2 tbsp of cocoa powder overtop. Then empty the chilled cherry filling overtop and spread out evenly. 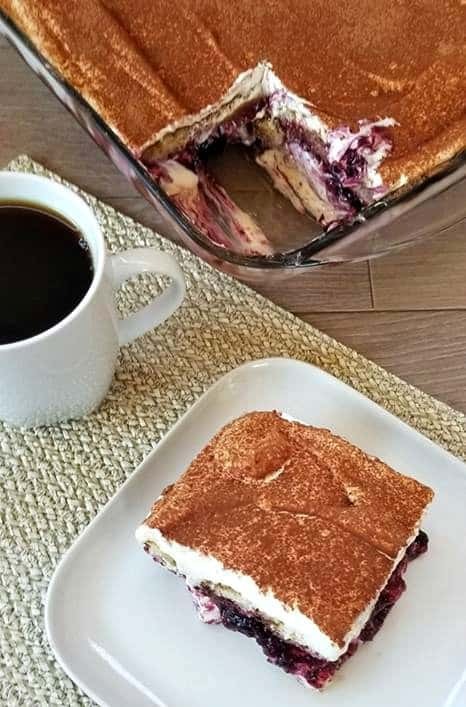 Repeat the process again with the ladyfingers and mascarpone and whipping cream, just skip the cherry filling this time because you would have had it all placed in the middle layer. 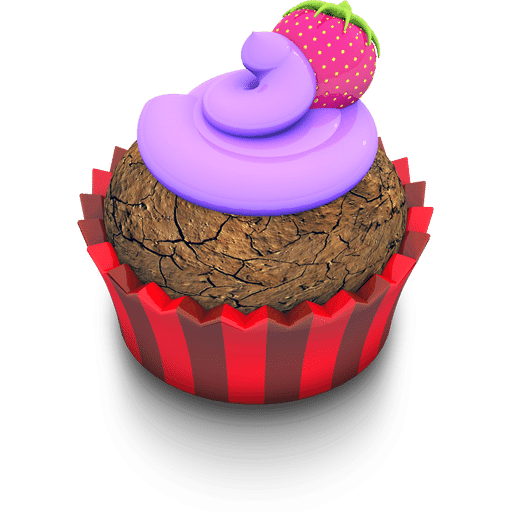 Dust one more time with chocolate cocoa powder and place in the fridge, anywhere from 6-24 hours. Serve chilled and enjoy!